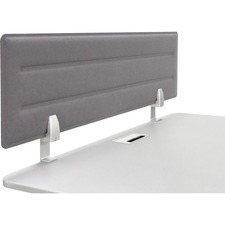 Tack-on accessory privacy panel adds comfort and focus to any desktop or personal space. It is ideal for open plan and sit-to-stand adjustable tables. Compressed felt construction serves as a tackable bulletin surface while reducing visual distractions and defining personal space. Frameless design yields a clean appearance. Solid cast steel mounting support brackets elevate the panel 3"" above the worksurface. Panel attaches to desktops of 1/2"" to 1-1/5"" thickness.